The popularity of local farmers’ markets and community-supported agriculture (CSA) initiatives often involves a common question: what to do with an uncommon or abundant supply of—insert fruit/vegetable/herb of choice here—and how should it be stored? Whether it is tomato or kohlrabi season, it’s easy to get overwhelmed by unfamiliar vegetables or an overabundance of seasonal bounty that seduces at the markets or shows up in a CSA box and then drifts over the kitchen counters. This wonderfully organized book by culinary instructor Julia Shanks and organic farmer Brett Grohsgal shows how to transform it all into delicious, nutritious meals. 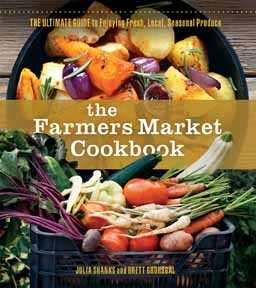 The cookbook describes many varieties of produce and suggests general preparation methods, before launching into a detailed chapter about storage, canning, and freezing options. Shanks and Grohsgal offer many examples of how to easily and economically prep seasonal harvests for later use. Learn how to stock frozen cubes of snipped fresh herbs to pop out later as snow piles on the windowsills, or how to keep a supply of onions or potatoes in the larder for up to 20 weeks, smartly purchased when the harvest is most bountiful and cheap. Recipes are grouped by meal type and many are noted as being gluten-free, vegan, or vegetarian. Most of the neatly explained 200+ recipes are riffs on culinary standards, but the authors, both former restaurant chefs, have plenty of zippy, innovative dishes to try. How about Turnip Bruschetta, Coconut-Sorrel Soup, Japanese Nuka Bran Pickles, or Sweet Potato Ice Cream? (Yes, please!) The index by ingredients makes finding recipes for a particular ingredient a snap, whether one is confounded by celeriac or baffled by a big bunch of broccoli raab.